There are multiple ways how users can submit records about Time spent during their work. Targetprocess requests them to update details on how many hours remain as well. Spent and remain time records can be registered on the following entities: User Stories, Tasks, Bugs, Test Plan Runs, Requests. 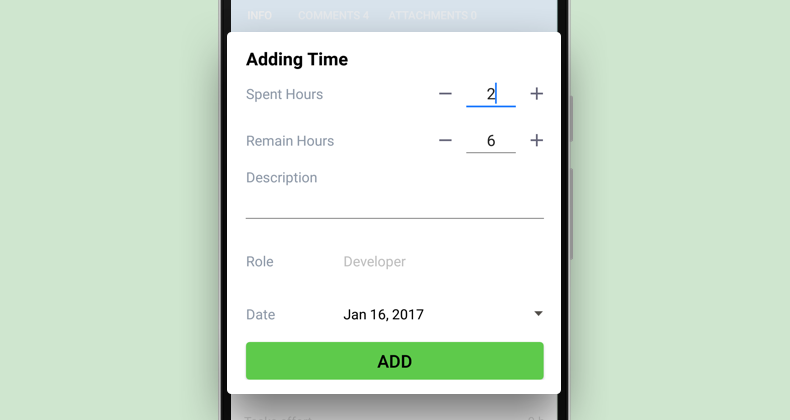 You can add time from the following places: Board and List views, detailed views, Time Sheet source control systems, IDE add-ins, iOS and Android mobile apps and within Toggl add-in. To allow users submit Time entries, Time Tracking practice and corresponding permissions of Roles must be enabled by Administrator. Fields on Add Time forms can be customized. In List views, Time columns are interactive. Click on clocks icon to add or edit a Time spent record. Time Sheet is a weekly summary table of Time records per individual user. You can add Time from an entity's Detailed view. Just tap the ‘Add Time’ button and the add form appears. 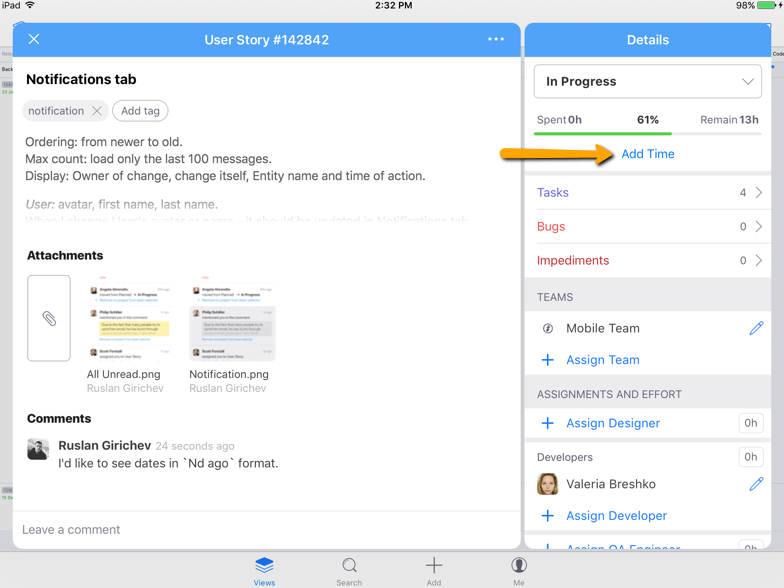 You can also add Time from an entity's Detailed view. Just tap the ‘Add Time’ button and the add form appears. All fields that are enabled from the web interface are available here (except for Custom Fields, for now). 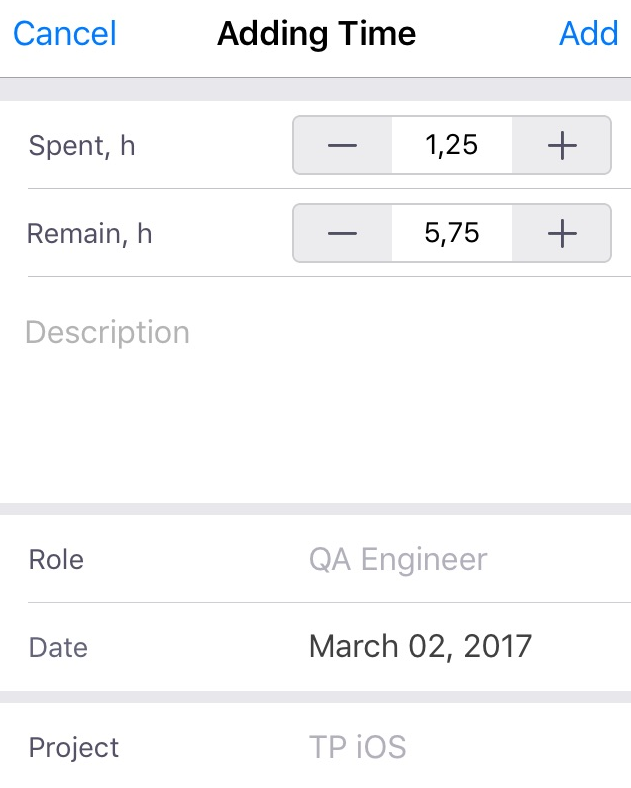 To submit time spent for the entity you're working on you can start and pause a timer in the app. Toggl Button is a Chrome browser extension that lets you track time from various online apps. It is possible to add Toggl timer button to Targetprocess entities and submit actually spent time easily. You will need to sign up with Zapier service to use this integration. The setup includes 3 steps on Zapier side, therefore For Work pricing plan is required. Most recent article on the integration between Toggl and Targetprocess is now available on our Developers portal. If you use Git, SVN, TFS or Mercurial, you can post Time by adding messages like “id:123 time:3” to your commits. If you use Visual Studio or Eclipse you can view your personal ToDo list there and post Time directly from your IDE.